I had ordered this set of rules when it was published. I ordered it from the US distributor,Pico Armor. It took quite a while getting here, apparently it was shipped from Poland by surface mail. Anyway, it arrived today and as my wife was taking a nap, I read most of it. The rulebook is 110 pages, black and white artwork and easily readable black text on a white background. (Do NOT get me started on the tendancy of rules publishers to print their rules on colored paper. They obviously do not want anyone over 40 playing their rules) While it does not have the eye candy of some recently published rules, it is very well presented, and has obviously been proofread. I did not find any typos or editing problems. 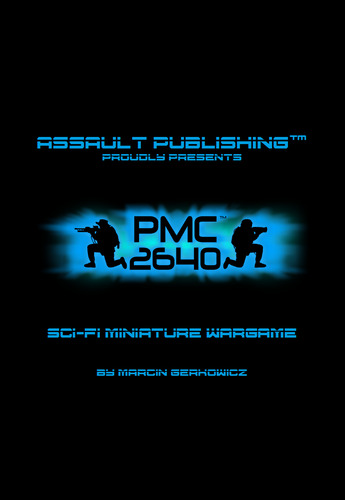 The rules are designed for individually based 15mm or 28mm figures, although there are optional rules for multifigure bases. (you just keep track of casualties) As multiple casualties are caused by exceeding the defence number of a unit, you do not have the problem of figures being too close together and taking extra casualties from blast weapons when they are on multi figure bases. 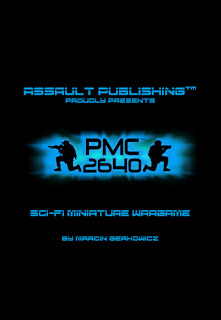 The rest is more information on aircraft and vehicles, some alien bug forces, solitaire scenarios (6 of them) and some optional rules. Noticeably missing, a Quick Reference Sheet. I looked on the website and did not find one in the downloads section. Being as there are 13 firing modifiers, and several tables, a QRS is pretty much essential. I hope they do one soon. The basic idea of this game is that you do not use WYSIWYG. Instead, they have various standard units. A "rifle" unit is pretty much the same for all troops, whether you are armed with a flechette rifle, laser rifle, or assault rifle. There are what is called tiers of troops. Higher tier troops of the same type will typically have a higher firepower number, assault number and a little higher defence. They do have many different types of troops, including light and heavy support weapons, mortars, etc. One odd omission that jumped out at me is that nothing seems to have an area effect. This seems to be deliberate. The firing mechanism is that you take the firepower of the unit, add various modifiers and a 10 sided die, and if the total beats the defense factor of the target, you cause one casualty for each point over the defense factor. This is obviously going to go quickly. You roll a 6 sided die for each casualty. You either cause no damage, suppression, or a kill. There is no mechanism for attaching a support weapon to an infantry unit. They are always separate units. Activation alternates back and forth between the players. If one side has twice the number of units the other does, they get to activate two units to each one for the other side. You cannot activate a unit to do nothing. If you have no units you want to perform actions with, the other side gets to do the rest of their units. There are vehicle and aircraft rules. I have not read them in detail, but the combat works the same as the infantry, except that instead of suppression vehicles take damage points. When it has more damage points than its structure number, is knocked out. There is a lot of information on scenarios, a campaign system, and a long list of standard units. My overall impression is that it will move quickly, with the addition of a QRS. My group plays a lot of different rules, and we always need reminders of how things work. There are very few sets of rules that I have played in my 45 years of gaming that I can remember without referring to some aid during the game. That being said, it looks like it might work well for us. We play on weeknights, and have limited time. I think this game will move quickly. There is some chrome to the game. There are two pages of Unit Special Rules. There are command units that can affect other units and allow activating more than one unit at a time. A unit with the hacking ability can redirect enemy drones to attack their owners. Some units can mark enemy units for indirect fire. I am going to suggest that we try the rules, and when we do a playtest I will post again. Very interesting information. I´m looking for a ruleset to use with the "Victoria Miniatures" I have bought, and perhaps this one can be THE ONE. When you bringing these over to play?